I spent most of my day today at work with my team. We were doing some server maintenance. This means a lot of down time while servers are moving, applications are installing, and files are downloading. 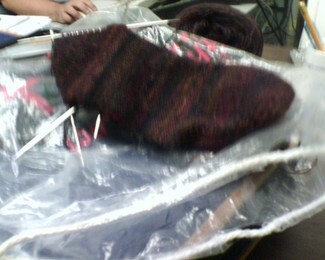 I remembered to bring my second Trekking XXL sock with me, ready for a few rows and then a re-do of the heel. I did get through half of the heel while windows 2003 SP1 and sql server 2000/SP3 installed. I sat in the server room, knitting and monitoring the progress. It made what is normally a very annoying task a bit more palatable. The work stuff was all successful, so tomorrow I have a day to myself to knit and spin (and blog).